The main debate at this year's National People's Congress in Beijing centered on the balance between socialism and capitalism, what Premier Wen Jiabao called the "two unswervinglies." 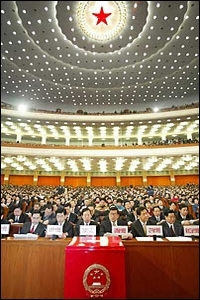 The communist country's first private property law, a new tax code for businesses, and increased social spending for rural regions were debated contentiously in the Great Hall of the People -- at least by the standards of China's highest legislative body -- as well as in the state-controlled press. Less controversial amongst the 3,000 delegates and Chinese press was a significant increase in military spending. However, this announcement caused the greatest anxiety outside of the mainland.